I failed as your intrepid Minister of Propaganda last week. We had a nice turn out for Makerday, but I left both my camera and cell phone at home. No way to document the goings-on. So this week I made certain both were with me. Dell hails from Indiana and is new to the area. He is a maker, and typifies the kind of person who finds a home at Dayton Diode. Living in an apartment poses challenges to us makers, especially so when there's a spouse-in-the-house. Limited space at home means working around the people we love who don't particularly share the joy when we take over the living room to glue-up a woodworking project, or commandeer the kitchen to assemble and debug the latest electronic thing. The Diode is the answer to that dilemma and he liked what he saw. Welcome aboard, Dell! 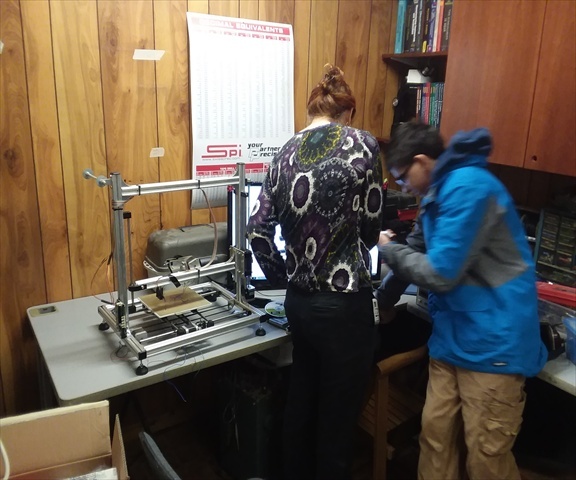 The dirty area was thrown into organized chaos by yours truly as I began the implementation of the new layout for this section of the makerspace. This did not affect most members who, conveniently, were working over in the clean area. The one member who was working in the dirty area, Steve, was using the CNC router, the one item in the dirty area not being moved around. The new layout will be in place by next Saturday – probably earlier, aside from 120 VAC electrical service for the west end of the area. I asked Jesse for a second opinion on the handheld circular saw from the Tool Library. 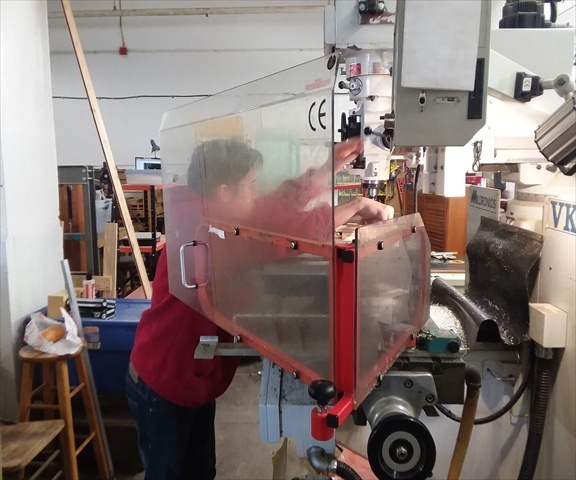 Given (I) its age, (II) the unavailability of an OEM replacement for the trigger switch, and (III) the fact that we have K-12 circular saws available for use, we decided to decommission the Black & Decker “Sawforce 100” saw and consign it to the demill pile. If the Dayton Mini Maker Faire holds Power Tool Racing this year, we have something to turn into a competitive racer! Worth saving - an HP plotter from the days when HP gear was worth the sacrifice! 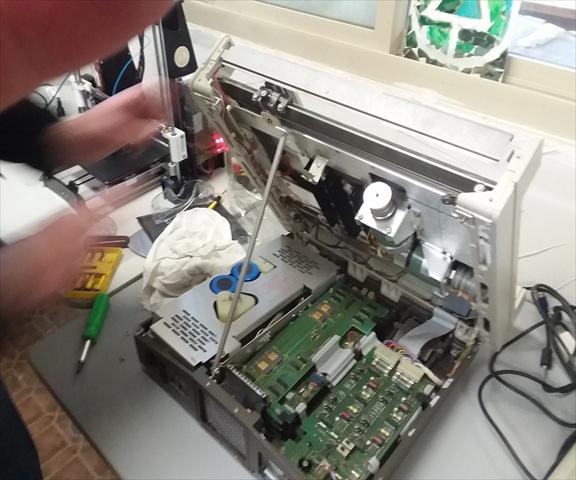 Jesse is overhauling a Hewlett-Packard X-Y plotter. Particularly vexing in this endeavor is the thin braided cable that drives the pen carriage in the two dimensions. The cable needs replacing, and this is no trivial matter as one must take into account the flexibility (spring factor) of the cable. I predict he'll be spending a lot of time on the Web looking for a vendor. FIRST completed cut from the CNC router since the move! 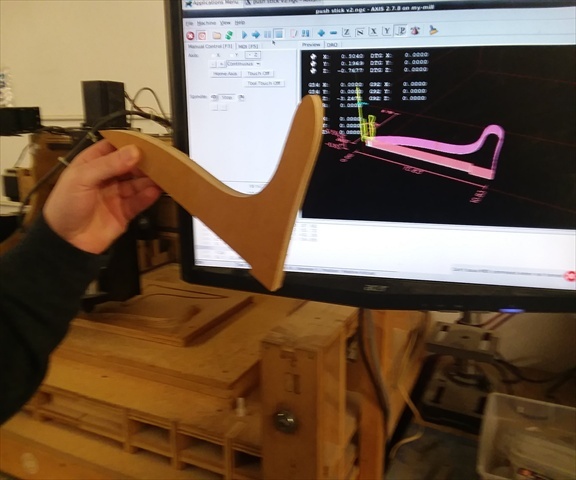 Steve continued his adventures with our CNC router. Progress! 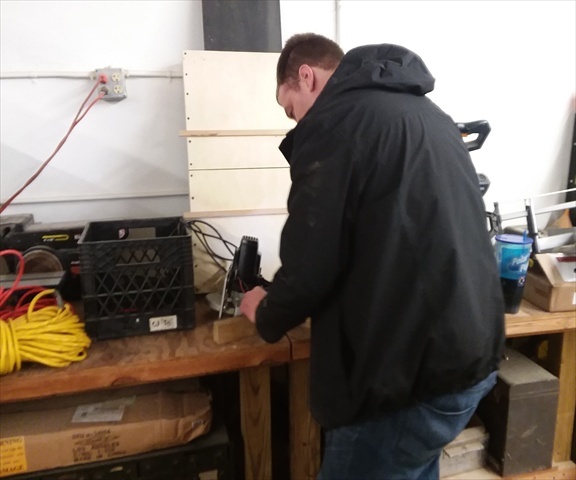 He swapped the end mill we had been using with a 3/8” router bit and was able to complete the first complete cut-out of a thing on the machine since the move – a push stick for the table saw. We had far less chip-out of the plywood material, but we still have some chatter. The chatter appears to be depth dependent – that is, the lower the router is along the Z-axis, the more chatter. As the router mount did lose some tiny ball bearings during the move, and there is observable play in the mount when force is applied by hand against it, we suspect the assembly will require servicing. I'll get with the maker who built the machine (currently inactive – new wife & baby will do that to ya!) and get the specifics of the design for next week. Speaking of next week, THE Monthly Makers Meeting will be held at the Dayton Beer Company bierhall next Sunday, February 11thbeginning at 5:00 pm. All makers, hackers, nerds & geeks, curious individuals, and spies of all kinds are welcome. Diodians are urged to attend. 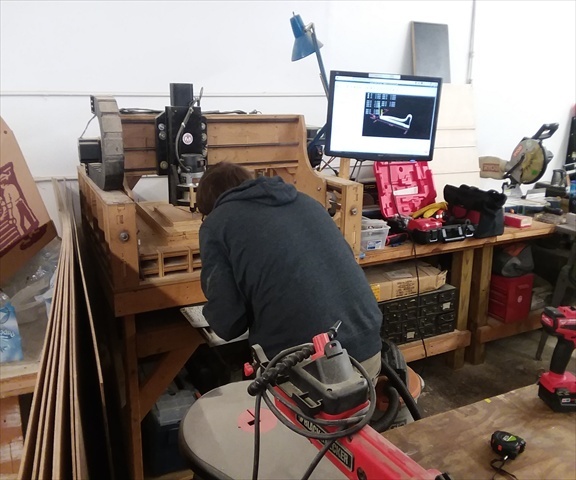 Our plan is to have everything in place to hold March's MMM at the new Diode makerspace. Keep your fingers crossed!